AllegroMedical.com presents The Nutren 1.0 Fiber Complete Liquid Nutrition. This nutritious liquid tube feeding formula is perfect for those with normal protein and calorie needs. Fiber blend helps support digestive health and normal bowel function. 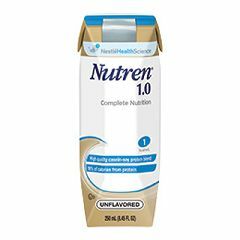 NUTREN® 1.0 FIBER offers 100% RDI of 20 key vitamins and minerals and also contains taurine, carnitine and ultra-trace minerals for long-term feeding. 25% of the fat content is MCT-oil, a special fat source that is easy to absorb. Contains 14 grams of fiber to support digestive health and normal bowel function. Produces Results. Maintains regularity. Satisfies Hunger. Simple To Take. Tube Feedings. Daily Use. Meal supplement. Caregiver. Regular User. Medical Professional. Used for bolus tube feedings for a cancer patient. Would also work well as a meal supplement for anyone who needs it, as it tastes great! No Side Effects. Alleviates Symptoms. Lifetime Care doesn't wan. Lifetime Care doesn't pay. My husband is on a feeding tube-he was having much problem with dry heaves. I searched the web and found your product-ordered a case and saw a huge improvement the first night he was on it-no more dry heaves. The only problem we have is Lifetime Assistance doesn't want to pay for your product. Still working on them to cover it. Produces Results. Simple To Take. No Side Effects. Decreases need for stool . I use this once a day and it it has made a difference. I have less constipation and use fewer stool softeners. I use g-tube for all foods and medications. Produces Results. Simple To Take. No Side Effects. Alleviates Symptoms. GREAT source of fiber, REALLY helps my Mom's constipation! Produces Results. Simple To Take. No Side Effects. If this was all you ate it could sustain you. It's used for feeding tubes and can also be taken just as a nutritional drink even without a feeding tube. I gave it to my Dad when he had a feeding tube and I never stopped drinking it. It's good for you no doubt. how meany calories per can ? anyone know ? Do you have anything that doesn't have any sugar or lactose free? Asked on Dec 14, 2011 3:10:12 PM by Marion from Kenosha,wi. I'm looking for a sugar free, and a salt free product. Used for PEG Tube feeding only. This product information indicates that this is lactose free.